Jerome Powell's remarks last week accompanying the Fed's decision to stand pat on interest rates and pause the contraction of its balance sheet seem to me to be unusually excellent. His willingness to eschew grand theories of either economics or central banking but rather to laud the qualities of patience whilst keeping a vigilant eye on the economic data, incomplete though it always will be, is a welcome outbreak of conceptual modesty and good sense. More, his overall observations seem sound: headline inflation is indeed in retreat this year, and whilst there was an unexpected slide in economic data around the turn of the year, the measures I use to assess cyclical pressures (return on capital indicator, capital stock growth, Kalecki profits, labour productivity, private sector savings surplus) are not flashing red. Indeed, not only do they not suggest a marked slowdown this year, they don't suggest a recession in 2020 either, despite the genuinely ominous inversion of the 2yr - 3m yield curve during the last week. In this context, what are we to make of the FOMC's decisions? First, let's consider the attitude towards the size of the Fed's balance sheet. Since 2017, the Fed has been shrinking its balance sheet by not re-investing all the securities it holds which mature. In practice, during the last 12 months that has resulted in the balance sheet shrinking on average by $36bn a month. The rate of this 'run-off' is to slow from May, and cease entirely in September. After September, further movements of the Fed's balance sheet will be made primarily in response to the normal exigencies of conducting monetary policy, which I take to mean the desire to tweak the level of bank reserves. Pause a moment right there: savour the lack of bombast, the absence of messianic certainty and mission. Doesn't that feel good? Doesn't that feel . . . novel? Now consider the context: 2018 was a year in which a sharply expansionary fiscal policy was offset by a sharply contractionary monetary policy. Thus, every month President Trump's fiscal deficit had the effect of putting more dollars into private hands than the government took out; but at the same time, the Federal Reserve's shrinking of the balance sheet meant it kept taking money back from the private sector. As far as the private sector is concerned, the positive cashflow from fiscal policy is at least partly reversed by the cash grab by the Federal Reserve. How does this balance? In the 12m to end-February, the fiscal deficit came to $932bn, whilst the contraction of the Federal Reserve balance sheet amounted to $430bn. With one offsetting the other, the balance of fiscal deficit minus balance sheet contraction left a positive cashflow to the private sector of $502bn. This was, in fact $147bn less than $649bn net positive cashflow seen in the 12m to February 2018. These numbers rather undermine the belief that the strength of the US economy in 2018 was primarily the result of the rising fiscal deficit, opening the possibility that what was doing the lifting was the supply-side implications of fiscal policy, rather than mere multiplier effects. Turning now to the slump in data seen during the turn of the year. Tracking this is made more difficult by the lingering tailback of data which piled up during the government shut-down. However, what data we have tells us retail sales ex-autos fell 0.1% mom in November and 2.1% in December, with the broader measure of personal spending falling 0.5% mom in December, despite a 1% rise in personal income. In response, December's manufacturing production fell 0.5% mom and this was followed by a 0.4% fall in January. Regional manufacturing surveys for January showed marked weakness in the Dallas Fed survey, the Richmond Fed survey, the Chicago PMI and the Empire State manufacturing index. The weakness extended into February in the Kansas Fed survey and the Philadelphia Fed survey, with only partial rebounds elsewhere. This weakness was responding to the opening of a disequilibrium between industrial supply and demand which had opened up in 4Q18. Subtracting movements in momentum of manufacturers' demand indicators (sales, inventories) from supply indicators (manufacturing output), the chart below tracks how that disequilibrium opened up, reversing the position from earlier in the year. There are two things about this to notice. First is the reversal of the nature of the disequilibrium: from manufacturers struggling to keep up with demand in the first half of the year, to oversupplying the market in the final quarter of the year. The second thing to notice is that the disequilibrium, though unexpected, is actually rather modest. Nonetheless, the impact of the disequilibrium showed up where one would expect it: in inventory positions. Manufacturers' shipments fell consistently between October and January, whilst their inventories rose. In January, for example, shipments fell 0.4% mom but inventories rose 0.5%. As a result the inventory/shipment began to rise quite sharply, reversing the falling trend seen since 2016. Again as one would expect, the impact was felt more keenly by wholesalers: their economic function is, after all, precisely to smooth short-term volatilities in supply and demand. Inventory holdings began to rise quite sharply in August 2018, and have continued to rise since: in January wholesalers' inventories rose 1.2% mom. By contrast, wholesalers' sales fell continuously between October and December, though they rose 0.5% in January. The result is that wholesalers' inventory/shipment ratio by January had risen to the highest point since July 2016. 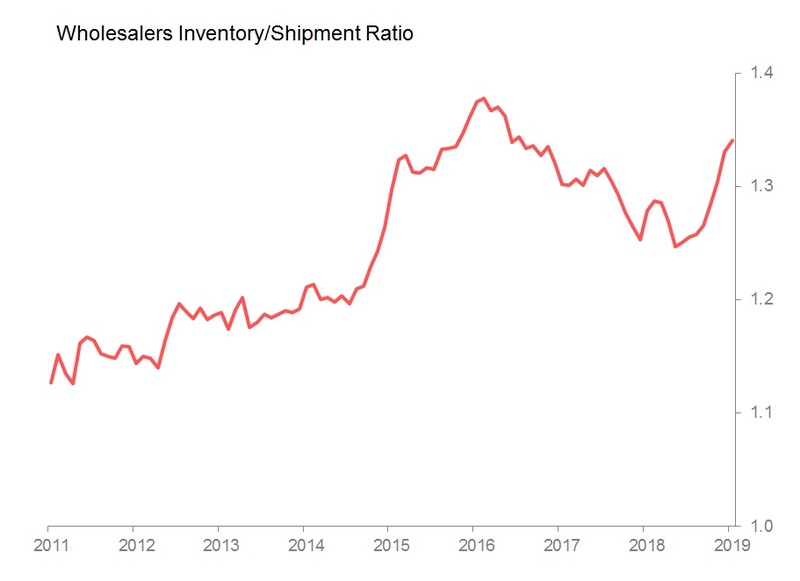 The rise in these inventory/shipment ratios tells us that manufacturers' disequilibrium has not yet been fully resolved: we should expect further signs of production weakness in the short term. The mechanics of that disequilibrium are easy enough to track, but the underlying cause is more difficult to fathom. Partly this is because we (still) do not have the full personal income and personal spending data beyond December. However, what December's numbers show is dramatic: whilst total income rose 1% mom and disposable income rose 1.1%, personal spending fell 0.5% mom, implying a Grinchier Christmas than any seen since December 2008 (when income was down 1.1%). Spending on foods fell 1.9% mom and spending on services rose 0.1% only. Meanwhile, interest rate payments rose 1.4% mom, and personal saving jumped 25.4% mom and 28.2% yoy, rising to 7.6% of disposable income from 6.2% in December 2018. I have previously suggested that movements in interest payments, and movements in the savings ratio together describe movements in the revealed financial stress felt by households. 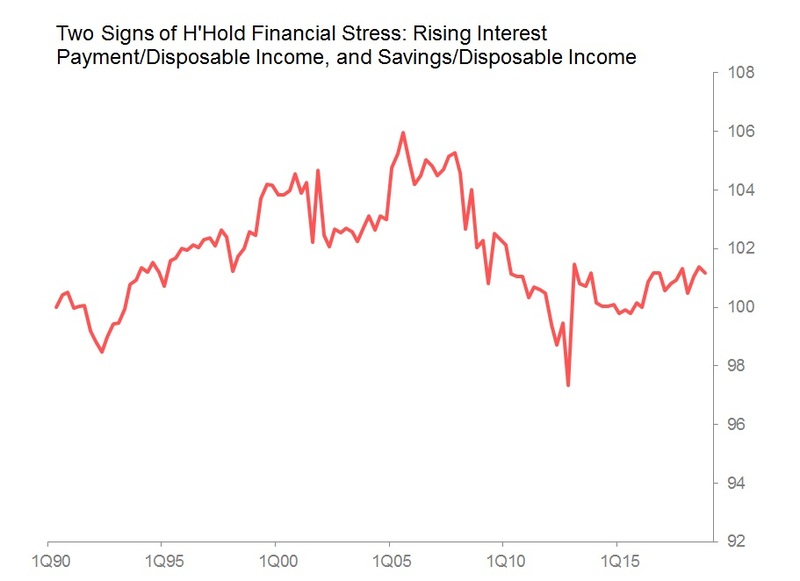 Since 2016, this measure of household financial stress has been rising, gradually and gently, true enough, but still rising. One interpretation of the extreme financial caution seen in December's jump in savings is that it acts to de-fuse some of that financial stress, allowing the overall ratio to stabilize. If this interpretation is correct, it tells us that although the industrial disequilibrium is real but modest, it was exacerbated by the underlying signals of financial stress from the household sector which remain fundamentally unaddressed. (And which has its roots ultimately in the historically extreme ratio of profits to wages.) In other words, there is a latent fragility in the current US economic structure which can be expected to resurface periodically, but which does not necessarily imply imminent recession. In these circumstances, the virtues of patience and data-vigilance accompanying a fundamental lack of aggression in either economic modelling or monetary policy conviction seem self-evident. With luck, it may finally signal the end of an era in which central bankers were completely unjustifiably elevated to the status of omniscient and omnipotent economic superheroes. That was better economic governance lies. . . .